There is no better way of reviewing a car than living with it day to day for six months. 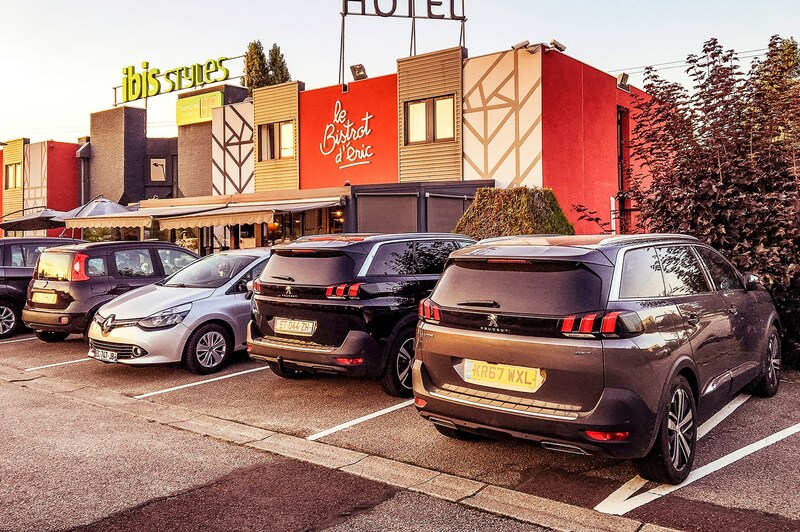 I took ownership of my Peugeot 5008 not thinking I would enjoy living with an SUV, but the Peugeot joined the family and flourished. The seven-seat 5008 sits on the border between SUV and MPV, and in GT trim is quite luxurious – and not cheap: nearly £37,000 including the metallic paint. 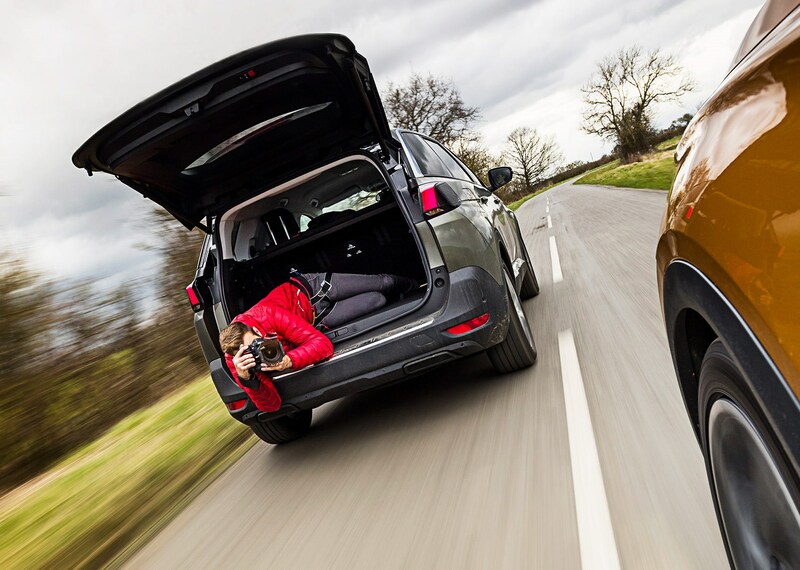 Ours is a 2.0-litre diesel with a six-speed auto ’box: an excellent combination for the high miles and often heavy loads that are typical of my driving life – sometimes family and luggage, sometimes mountains of photographic gear, often both. In my 12,000 miles with the 5008 it’s ploughed through the Beast from the East (albeit at one stage stopping every 10 minutes to pour water over the screen as the stupid wiper-mounted pipes kept freezing), spent a few weeks with the sunroof refusing to close properly (my local car-wash guys like a challenge) and played sat-nav roulette on the numerous occasions when the infotainment system would just switch off. Clearly this is annoying, but the dealers have been quick to help and at one point – when a problem with the powered opening of the boot was being investigated – provided me with a replacement car. Experiencing the same car with a smaller engine and lower trim helped give me a greater understanding of what the 5008 is all about. On paper, a 1.2-litre petrol engine might seem inadequate for a 1.5-tonne car, but in fact the engine was mightily impressive. Not as grunty as the 2.0-litre diesel, of course, but willing and peppy. The lack of leather in the cabin didn’t make it feel any cheaper, although it would probably be tougher to wash crisps and chocolate out of. The deletion of the massage seats and panoramic roof also gave me a little more headroom; I’m 6ft 3in tall, and when driving the higher-spec car I was slouched and sometimes left with an aching back. Despite the too-frequent glitches I really warmed to the 5008, and it opened my eyes to the pleasures and practical advantages of the family SUV. So it’ll be interesting to find out if switching to an old-fashioned estate car – the Mazda 6 estate – feels like a backward step. I've just completed a 1584-mile trip the South of France and back with my family, storming the péages like a German executive. Come off the immaculate toll roads onto the twisty stuff and the 5008's crashy ride comes to the fore. In the south you can only admire the French brand loyalty; Peugeots are everywhere. Less so up north, though, where the usual suspects from the rest of Europe are more numerous. No news is, they say, good news. 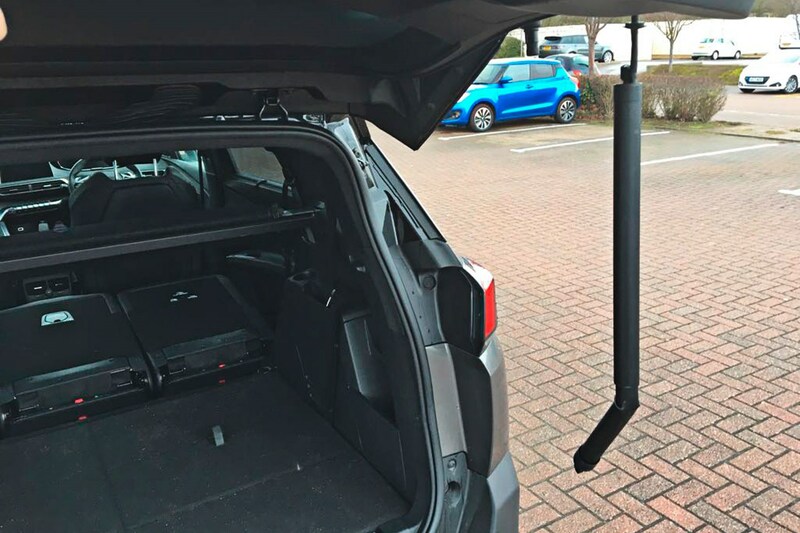 That may not be an attitude much favoured in the publishing business, but it's music to the ears of anyone who relies on a car for their daily work, rest and play. A quirky approach to reliability might be all part of the character-building fun if you're a TVR owner, but an uneventful month in the 5008 means I've been able to happily get on with my life; the Peugeot has been willing accomplice, not obstacle. Some of the best cars in the world are utterly ridiculous if you attempt to live with them day to day. The 5008, by contrast, is so easy to live with that you take it for granted. The comfortable cabin, the huge boot, the torquey 2.0-litre diesel all make it perfect for my daily needs. I've reported previously about how great I think the chassis is, and having lived with it for almost six months now I'm still extremely impressed with how hard you can drive it (or indeed have to drive it when your working day involves trying to keep up with Ben Barry). The brakes also have great feel, light enough but superbly powerful when you have to give the pedal an extra squeeze. When you're pushing the 5008 hard and you hit a mid-corner lump, you can sometimes feel the back end skip. It doubtless feels much more spectacular than it looks, and never turns into anything serious; it quickly plants itself back on the road. I suspect the skipping wouldn't happen if the car were weighed down by more passengers and more luggage, but then you tend not to drive so hard when you're carrying cargo. Engaging Sport mode holds the gears, firms up the steering and gives the engine note an enhanced 'sporty' tune. It may seem perverse on a seven-seat family car, but it keeps me entertained (until I remember that my photography gear is being scattered around the car). On a handful of occasions the 8-inch touchscreen has frozen. But like an illness that disappears when you finally get a doctor's appointment, it never does it when you want to prove to somebody else that you're not imagining it. Why do these things always happen when you need the next sat-nav instruction, or you're getting to the good bit of your PJ & Duncan album? We’re thousands of miles into our tenure with the 5008, and all those initial niggles are long forgotten. It’s taken me and my camera gear the length and breadth of the country, chasing supercars, priceless classics and everything in between. Peugeot’s i-Cockpit is a beautiful place to be when you’re leaving home in the early hours on an airport run, or when you’re slogging back home after a long day’s shoot. I recently drove the boss’s Audi RS5 on a 1000-mile round trip to the Continent and found myself longing for some of the Peugeot’s familiarity and comforts. 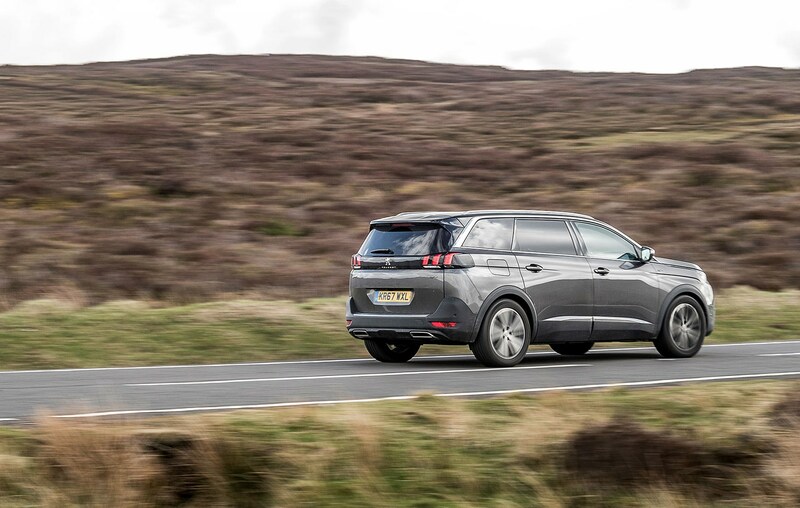 The quality of the cabin might not be up to the Audi’s standard but the ergonomics and styling have moved the 5008 ahead of its rivals in that booming category of seven-seaters that can just about be called SUVs rather than MPVs. I’m really falling for this car, and I’ll sing its praises to anyone who enquires, particularly its roadholding. I’m no road tester but as a photographer I’ve driven a lot of cars over the years and I’m mightily impressed by how well the 5008 sticks. Get it into a rhythm on a winding B-road and it will keep up with some far superior cars. Forget the transmission, because there’s no point pretending it’s anything other than what it is, but the chassis makes the 5008 a surprisingly fun car to drive. Month 2 of our Peugeot 5008 long-term test: the tailgate has broken! The 5008's tailgate has been proving reluctant to open under its own steam, so I've been helping it out – no big deal. At least until, on one occasion, it won't let me lift it. None of the unlock or boot-release buttons help, a warning bong suggesting all is not well. I need my photo gear so I ease it open, but it then refuses to shut. Ah. Leaving the car open and unlocked simply isn't an option, but closing it is a painful experience that also damages a strut. Peugeot is investigating, and I'll keep you posted. Yep, that is indeed how we take the car-to-car shots that often grace the pages of CAR magazine. Crazy, you might think. My view: just don’t think about it… We’re harnessed in, so we’re a safe load and shouldn’t fall out. Why are you looking at a picture of me hanging out of the boot of a Peugeot 5008? After a previous stint on CAR designing pages, I’m now one of the magazine’s regular photographers – so regular, in fact, that CAR has asked me to run a long-term test car. I do a lot of miles in a lot of different places, often having to keep up with some pretty rapid cars. I need to carry a heap of gear – and hang out the back on occasion – not to mention the demands of a young family when I’m not at work. So one way or another this 5008 is going to get thoroughly tested. We’ve gone for the high-spec GT diesel. Ours is a 178bhp 2.0-litre four with a six-speed automatic transmission and front-wheel drive. 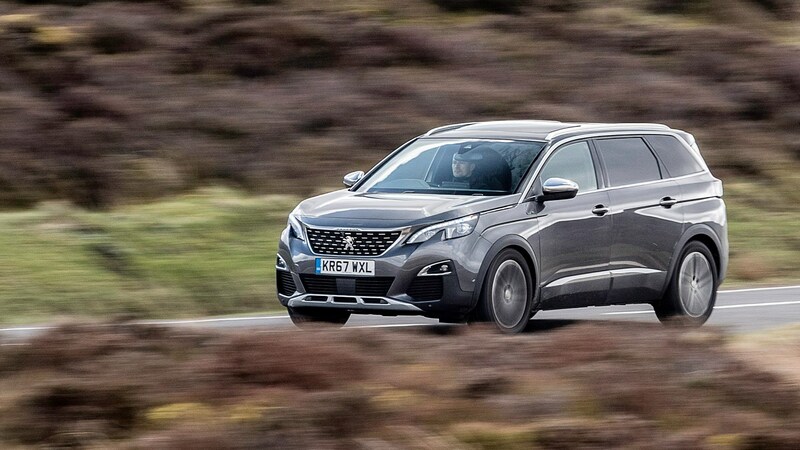 Some fiddling with Peugeot’s UK line-up means the GT-spec 5008 with that engine will soon have an eight-speed auto instead of our six-speeder. 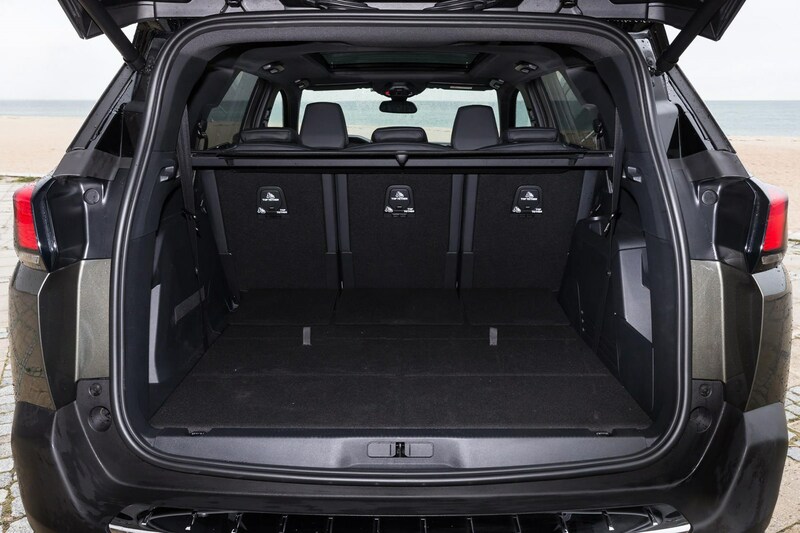 It’s a seven-seater, with a good-size boot (below) even with the removable third row in place, but the on-the-road price of £36,215 still seems on the high side. But then you look at the long list of standard safety, comfort and in-car entertainment features and it starts to make sense. The GT comes with the panoramic glass roof, full leather (on all seven seats) and multi-point massage function (only on the driver’s seat, to the annoyance of my wife). We’ve also added a few extras. Choosing metallic Nimbus Grey paint adds £525, the Focal hi-fi system adds £590 and the Visio Park 2 system (360° camera with Automated Parking Assistance) a further £450. That takes this car’s price to £37,780. That’s raised a few eyebrows, so we’ll be keenly assessing the car’s value for money over the next few months. 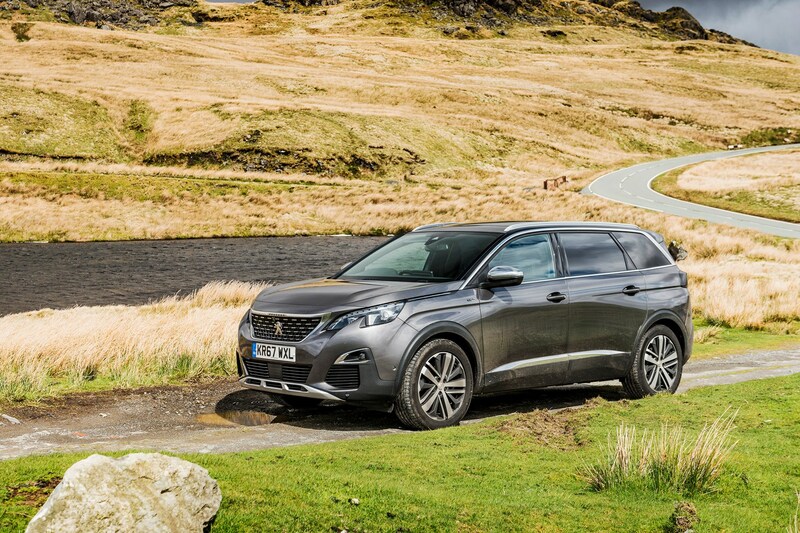 Having read about Anthony ffrench-Constant’s time with the Peugeot 3008, documented over six rollercoaster months in these pages, it’ll be interesting to see if the 5008 is essentially a bigger version of the same mixed bag. I suspect not; initial observations are extremely positive. The 2.0-litre diesel provides enough power to make the seven-seater a genuinely fun drive; get it flowing on a B-road and it’s a riot. The i-Cockpit is mostly good, in that the design is impressive and so’s the quality of the materials used. But let’s reserve judgment until we’ve clocked up a few thousand miles and seen how the fit and finish cope. As I write this first report the car is already back with Peugeot, having a faulty electric boot repaired. The silver lining to that cloud is that its temporary replacement is another 5008, a 1.2-litre PureTech petrol in entry-level Active spec, giving me the chance to compare my car to a version that costs £10,000 less. I’ll let you know how that works out.